Produktinformationen "Starter-Kit Power supply, cables, Adapters"
Each Starter Kit contains all necessary cables and a power supply. 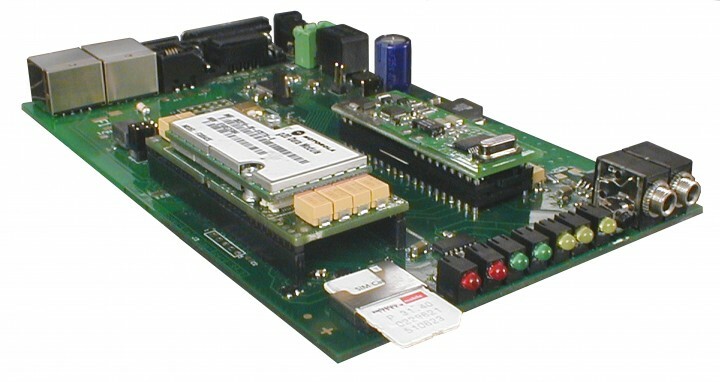 Evaluation Board for easy Testing of both Conexant Style and DIL- 40 Socket Modems. It provides a quick start solution. • Easy Testing of Socket Modems with serial Interface. • Complete, ready-to-start Test Environment. • Both Conexant Style and DIL-40 Modules are supported. • Provides all necessary interfaces to test GSM, LAN, ISDN and PSTN modems. • Quick start, even if your final target system is not ready yet. • Serial RS232 Interface with D-SUB 9 Connector and speeds up to 115.2 kbps. • Power Interface for external Power Supplies. (7 – 12 VDC @ 1A). • RJ11 Connector for Analog PSTN line. • RJ45 Connector for ISDN S0 Bus. • RJ45 Connector for LAN. • SIM Card reader for external SIM. • Mini Jack for Microphone Input. • Mini Jack for Speaker output. • Serial Interface Status Leds with TX, RX, DCD and DTR. • Socket Modem Status Leds: DCD and GSM Status Indicators. • Power Indicators: 5 VDC and 3.3 VDC Power indicators. • Typical Power use: 1200 mW. • Serial ITU-T V.28 (EIA/TIA-232-E) interface. • Configurable Interfaces for PSTN, LAN, GSM and ISDN. • Selectable 5V or 3.3V DC Power. • Speaker Output and Microphone input. • Each Starter Kit contains all necessary cables and a power supply. Weiterführende Links zu "Starter-Kit Power supply, cables, Adapters"